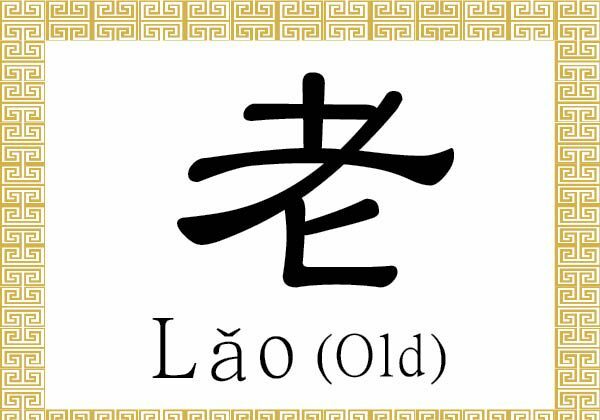 The Chinese character 老 (lǎo) means old, aged, or elderly. It also refers to being venerable, skilled, expert, or experienced. Also a radical used to form other characters, 老 (lǎo) is an ideogrammic compound composed of two parts: 耂 (lǎo) on top, which is a variant of 老, and 匕 (bǐ) on the bottom, a radical and character that means a spoon or ladle, or a knife or dagger, but depicts a cane in this case. Together the two parts depict an old man with long hair leaning on a cane. 老實 (lǎo shí) describes someone who is simple, honest, and good-tempered. 實 (shí) means real, factual, solid, or true. 老成 (lǎo chéng) conveys the idea of being experienced, steady, or mature. 成 (chéng) means being capable or to succeed or accomplish. The idiom 老當益壯 (lǎo dān yì zhuàng), where 益 (yì) means beneficial or useful and 壯 (zhuàng) means strong or robust, refers to being active and vigorous despite one’s years, or enjoying a hearty and healthy old age. The idiom 老馬識途 (lǎo mǎ shí tú), literally “old horse knows the way,” praises a veteran or an aged and experienced person for his or her knowledge and wisdom. 馬 (mǎ) is the character for horse, 識 (shí) means to know, and 途 (tú) refers to a road or way. Knowledge and wisdom starts from being an attentive and diligent learner from a young age, as advised by a verse from the “Three Character Classic”: 子不學, 非所宜 (zǐ bù xué, fēi suǒ yí); 幼不學, 老何為 (yòu bù xué, lǎo hé wéi). The verse states that if a child does not study and learn, it is not proper, and if the young do not study and learn, then what will they do when old? The “Three Character Classic,” or “San Zi Jing (三字經),” is a classic Chinese text consisting of inspiring short verses composed entirely of character triplets. The poetic text covers a broad range of subjects including literature, history, philosophy, astronomy, as well as ethics, morality, and proper social decorum.